What Stretching Exercises Can I Do To Relieve Severe Lower Back Pain? What is the best way to deal with neck cramps? Imagine sitting in the chair in your office and at some point you quickly turn around and bend your back and your chest a bit. You do it so suddenly that you immediately feel a throbbing heat in the lower back area. Later, when you get up, the pain intensifies so much that it radiates your leg and part of your waist. Muscle stretching can occur when one is resting or moving after a sudden action or stroke. Symptoms may include muscle spasms until complete restriction of movement. Muscle elongation also affects the tendons and ligaments of this area, which causes inflammation. How to treat muscle strain? As soon as you feel the elongation, immediately apply an ice pack on it. Later, alternate with bags of hot water. Keep the rest for 24 hours. Once this time has elapsed, you can do gentle exercises to regain mobility. The gels or natural treatments based on arnica are wonderful for these cases because they are great anti-inflammatories. Our intervertebral discs are small pockets full of fluids that are between the vertebrae, like small pads that dampen our movements. If we suffer from a herniated disc due to a blow or a bad movement, we feel not only a pain, but also a tingling, cramps and we can also notice a small protuberance on the back. The pain is more intense in the morning. This condition is very common among athletes-ve-s.
First of all, a good medical diagnosis is necessary because sometimes the lesion can be serious and it is essential to perform a surgical intervention. In this case, rehabilitation and the help of a good physiotherapist are important. Always working in the same position or doing tasks that require great physical effort necessarily imply a weakening of the back, which can generate chronic pain. Any movement pattern, such as turning on the right side of the back, results in many of our column structures ending up compressed and inflamed. Gradually, one suffers from a progressive and weakening lesion. How to treat injuries due to repeated efforts? 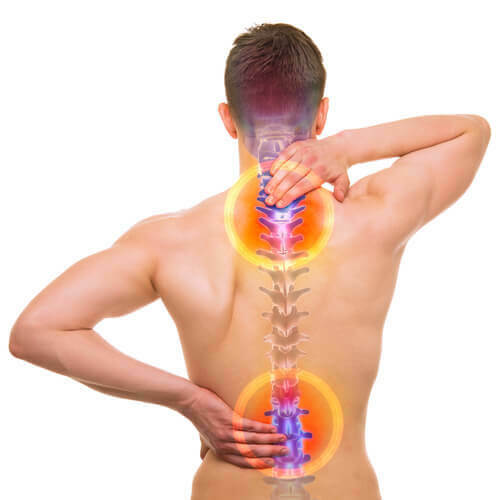 The older we get, the more fragile and thin the intervertebral discs become, and the more the joints are squeezed. In addition, the cartilage loses elasticity, becomes rigid and little by little, gives rise to the famous osteoarthritis . Genetic factors, obesity or even lesions of the past result in the slow progress of this disease. It is necessary to know, first of all that this type of degenerative diseases has no cure: we do not cure of these diseases. What is possible, however, is to control the symptomatology in order to reduce the pain and thus enjoy a better quality of life. Always be on the move: inactivity makes joints stiffer, and sitting for extended periods of time compresses the intervertebral discs even more. Go out walking every day. There are exercises that are very suitable for relieving lower back pain, such as “Qi Gong”. It is a Chinese exercise practice that mixes breathing positions and techniques. Eat foods with anti-inflammatory properties, like all those rich in omega-3 fatty acids. Do stretching exercises every morning as soon as you get up. Consult your doctor to find out if you need to take vitamin D supplements and magnesium . They are excellent for strengthening bones and joints. To conclude, we are aware that lower back pain requires special care and proper medical follow-up. Here, we recommend that you try any type of therapy, without excluding pharmacological treatment, as well as physical exercises. Similarly, it is important to follow a balanced diet and take care of your postural hygiene. Any good consideration of your spine translates into well-being.